PRESIDENT Rodrigo Duterte never closes his door on peace negotiations with the communist movement, Malacañang said Monday, April 15. This was the statement of Presidential Spokesperson Salvador Panelo, following Duterte's latest plan to form a new panel to negotiate peace with the communists despite the declaration of "permanent" termination of peace talks in March. "If you will notice, the President has always made himself open to any talks on peace. Ever since, sinasabi niya 'yun. 'Di ba palaging sabi niya, 'Bigyan natin ng kaunting window (He's been saying that ever since. He always says, 'Let's provide a window),'" Panelo said. On March 21, Duterte announced the "permanent" termination of peace dialogue between his administration and the communist leaders, saying he is no longer interested to forge a peace pact with them. The President, however, backtracked his earlier pronouncement on Saturday, April 13, after he bared that he is mulling to re-open talks with the communist party by creating a military-led peace panel. In a statement on Sunday, April 14, communist founder Jose Maria Sison advised his party's political wing, the National Democratic Front (NDF), to be wary of Duterte's plan. Sison also claimed that the Commander-in-Chief is merely creating a "war panel." "The NDF would not want to be baited into accepting a war panel, or a panel that is dominated by the military whose purpose is mainly to seek the impossible such as the surrender of the revolutionary forces especially the New People's Army," he said. 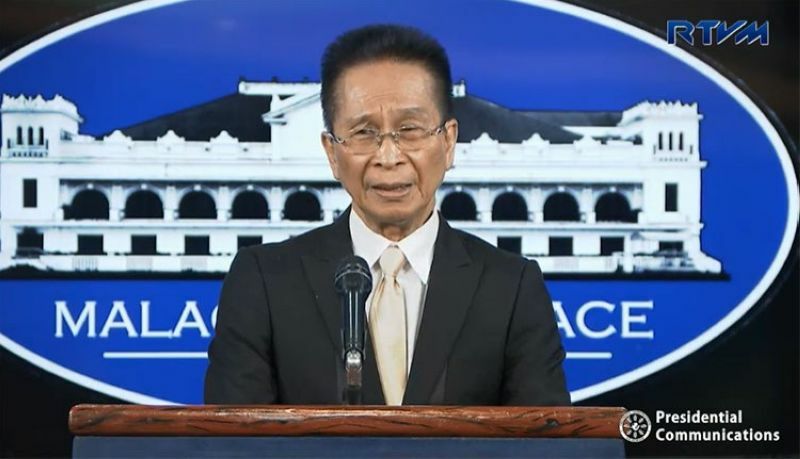 Responding to the communist leader's remarks, Panelo said "it does not matter" whether Sison hates Duterte's plan or not. "It doesn't matter whether he (Sison) likes it or not...? Eh di ba sinabi na natin na (We have said that) we will ignore him," the Palace official said. "Eh wala pa naman eh. Sinabi pa lang niya 'yun. Wala pa siyang kini-create (The panel has yet to be created. It's just a proposal. He has yet to create it). It's still an idea," he added. A proclamation signed by Duterte in November 2017 officially scrapped the peace negotiations between the government and the communist group.